If you had to do it all over again, would you do it differently? When I look back at the various car projects I’ve tackled, I realize I’ve learned a few lessons along the way; Which upgrades have the most impact? When are budget brands worth it? Which upgrades to tackle first? I consider the combination of cost, effort, and impact on the driving experience when setting my priorities. In particular, I’ve learned a lot about GM A bodies (Chevelle, Skylark/GS, Cutlass/442, Tempest/GTO) because, I’ve owned 4 of them. I’m sharing my conclusions in hopes that it gets some of you a fun ride for less money in less time. While these recommendations are intended for GM A bodies, most will apply to other models too. That said, this doesn’t apply to the track. Race cars have different goals than driven cars. Imagine you just purchased a fairly original yet worn GM A-body. It looks cool but probably drives like crap. I would approach the project with the following upgrades in the following order. This was the single best modification that I have done to any car. If your A-Body has manual steering, it’s like steering a tanker. Parking is a hassle. Low speed maneuvering requires extra effort. The manual steering has a super high ratio so it is as responsive as a half beached whale. You’ll also find the steering box is too worn to fully adjust out the play. Converting to a modern quick ratio power steering box changed my driving experience big time. Not only was it more pleasant to drive and park but also it was much more responsive on curvy roads roads. The car went from being a chore to being a blast. I’ve upgraded several car suspensions in a piece-meal manner due to budget constraints. I do the front first and the rear later. The front makes a big difference right off the bat. The rear, not as much. Changing only the front, while not optimum, allows you to push the turns much harder than with the stock bar. Suddenly your car handles and driving gets more fun! If you’re tight on funds upgrade just the front sway bar and add a rear sway bar later. For the GM A bodies, I’ve found that front anti-sway bar between a 1 1/8″ and 1 1/4″ offers a great balance between handling and ride quality. I actually started with 1 3/8″ bar and detuned twice to smaller bars. I think I’m currently running a 1 1/4″ hollow bar with polyurethane bushings. With each detune the ride quality was noticeably better but loss of handling was trivial for a street car. I’m currently running a 7/8″ anti-sway bar in the rear. My car thinks it’s a Mazda Miata! Wait until you need to buy tires and then increase to 15″ or possibly 16″ rims from a junkyard or swap meet. These sizes are still around and will cost you much less than new rims purchased from the aftermarket. I’m not a big fan of real low profile tires because they are more prone to damage and the lower side wall does not protect your rims when parking. Sure there are handling benefits with 17’s or 18’s but I’ve found that I can toss my ’67 Pontiac LeMans around on my 15’s and keep up with most modern cars. The incremental cost for 17’s may not be worth it. Maintain tire pressure on the high side. That will make the tire flex less and thus handle better. Don’t buy bias ply tires. They won’t track nearly as well as radials. When I first got my LeMans, I replaced a fairly unworn pair of bias ply tires in the front with an unevenly warn set of radials that I had laying around. I changed them because the radials were wider and I was seeking better road holding. I didn’t expect the substantial improvements in tracking that came with my ragged radials. Suddenly, I was making way fewer corrections while driving down a straight highway. This is worth it only if you need to change your ball joints or front springs anyway. The parts are inexpensive but the labor is involved. They are not necessarily required with other models. For GM A-bodies, tall ball joints get you more caster and camber into your suspension settings. This has a noticeable impact on your handling. You can still get your car to hold the road well with stock ball joints but if you have to change them anyway, the incremental cost is small. If you’re just changing front springs I’d upgrade to tall ball joints at that time because half the job is done at that point. Displacement – You won’t get much more than 300 hp out of a Buick 300, Pontiac 326, Chevy 283, or other small V8, without compromising drivability, and reliability. Condition / age – Does it need a rebuild? Does it burn oil? Does it make good vacuum? Is there hardened sludge inside the engine? Is the valvetrain intended for leaded gas? It’s not worth dropping cash for a cam, intake manifold, and carburetor on an engine that won’t last or won’t gain much power. Is the engine well supported by the aftermarket? If you’re going to stick it out with the original engine, change the timing gear to an all steel unit before it fails. You don’t want plastic gear pieces floating around the engine clogging up your bearing journals. Displacement is the best way to go for streetable power without sacrificing low end torque. Displacement also usually wins in terms of horsepower per dollar. Considier a Chevy crate engine. If you drive a Chevy it’s a no brainer. They are very affordable – offering great HP / $ values. 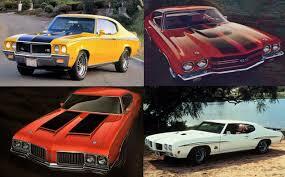 Driving a Pontiac, Olds, or Buick? You may have mixed feelings. I understand. Don’t forget this is for a daily driver. When you’re behind the wheel you can see what engine is under the hood. Converting to a Chevy Small block engine for you BOP folks is still inexpensive but recognize you will drop some bread on the bellhousing and clutch linkage or trans adapter. You will probably also have to reroute fuel lines and and starter wiring too. The conversion is fairly easy though. If I can do it, it’s easy. Motor mounts, bellhousing, and clutch linkage for a Chevelle will mostly bolt right in your BOP A-body. Lastly, you may want to change front springs because the small block Chevy may weigh less than your original block. You don’t have to but the ride height will change. I’m currently running stock front springs from a Buick Special in my Pontiac LeMans with a Chevy 350. If you’re upgrading engine power, upgrade your motor mounts to at least the interlocking type. I doubled the horsepower on my 65 Bel Air and broke the motor mount inside of a week. It also chewed up my fan shroud and lost my clutch linkage when the engine lifted. Then I broke the interlocking type of motor mounts a month or so after that. Now I’m running polyurethane mounts. This is worth doing. You don’t want to risk overheating your new investment. Make sure you have sufficient cooling capability. Get a bigger radiator spec’d for your engine. It is typically sized on horsepower. Then add a fan shroud. You don’t need an electric fan. That adds cost, unnecessary parts, and reduces reliability (it’s just something else to break). Unless you’re tight for space or pushing extreme horsepower, a belt driven fan is all you need. Warning: This is just my theory without a lot of data. I’ve had both, power and manual brakes. I believe you get more control with a conversion from manual to power than a conversion from drum to disc. Drums are just fine for the street – especially if you’re on a budget. I’ve had several power drum cars and rarely wished I had more brakes. However, I’ve had manual brakes in a few cars and had to change my shorts after a few hard stops. If you can afford to do both great! If you’re funds are limited and you must choose between the disc and power, I would go with power. I believe in most cases, the power booster will be compatible with a disc brake upgrade down the road, BUT make sure you have sufficient engine vacuum otherwise the upgrade may feel trivial. If you do convert to disc, avoid increasing track width. This is important with the A-Bodies. There is not a lot of room between the wheel and the fender. I’m running stock drums with 215-60 / R-15’s on the front. I’d like a 220 but I don’t have the space. If I were to convert to disc, I could not afford to increase track width at all. Sometimes it’s worth it to buy from a name brand. I bought from a lesser known brand when converting to discs on my Bel Air and they underestimated the increase in track width. They said it would only increase by 3/4 of an inch but it turned out to be 3 inches. Fortunately I had the space on the Bel Air. For street driving, you don’t need it. 99% of the time you won’t miss it – especially if you have a weak engine. For a street car, the upgrade to posi does not offer enough impact in the driving experience to justify the cost… at least until you get your drivetrain beefed up. That said, changing the rear end gear ratio can have a big impact on your driving experience. However, unless you have an extremely low or high ratio, I would delay that upgrade too. I’ve been satisfied with ratios between 3:07 and 3.33:1. Outside that range and the car is either revving like hell to maintain highway speeds or it is a pig off the line. You might be better off converting to an overdrive transmission with a lower first gear than to change your rear gears – depending on the condition of your existing drivetrain. This last one is at the bottom of the list because this article is about driving. That said, one of the most impactful visual mods comes from the right stance and therefore there is visual bang for the buck here. When a car is perched just right, you don’t see the rust, the mismatched colors, or the small dents. Springs cost less than body work. Be careful with stiffer springs. I lifted the rear of my LeMans with station wagon springs. It sits great but I got a stiffer ride. In my Bel Air, I used a stock spring with shims under the lower spring perch to give it some lift without sacrificing ride quality. Use basic gas shocks or adjustable shocks. A stiff shock will reduce ride quality too. In my cars I’m able to achieve decent handling with a basic gas shock, stock spring rates, and the right sized anti-sway bars. In closing, I suggest you prioritize your upgrades in ways that impact what you feel behind the steering wheel. Of those upgrades, do the easy or inexpensive ones first. This will make your car more fun in less time and for fewer bucks. I don’t have all the answers. I’m mostly a self-taught backyard mechanic. I’m sure there are still plenty more to lessons ahead. Feel free to weigh in and educate us with your ideas and experiences.